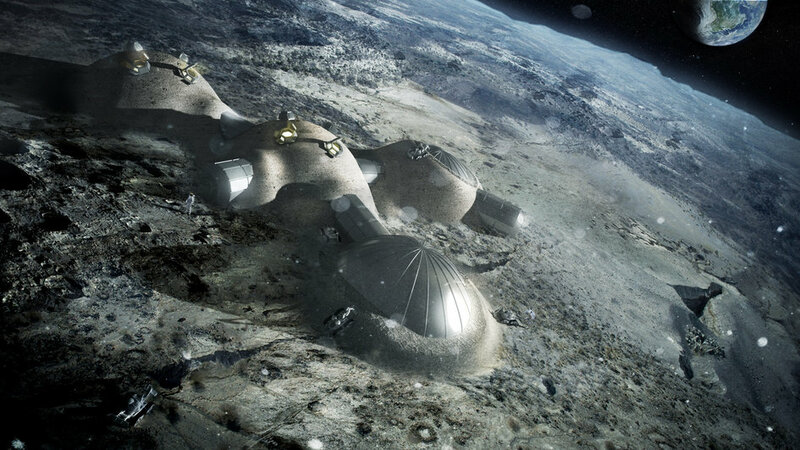 A crazy Moon Village project has been announced by European Space Ageny boss Jan Woerner. It was Prof. Warner himself who described his idea as ‘crazy’. He would like the International Space Station, which will be shut down in 2024, to be succeeded by a Moon Village, which would be constructed by robots and 3D printers using moon dust and rocks as raw materials. Material on the Moon would be used, for example, to build a large observatory to look into space. On the far side of the Moon, looking into space is particularly interesting, Prof. Woerner believes. Johann-Dietrich ‘Jan’ Wörner, 61, a German civil engineer, university professor and former president of Technische Universität Darmstadt, succeeded Jean-Jacques Dordain as Director General of the European Space Agency on 1st July, 2015. Prof. Woerner envisages several nations, economic blocs and space exploration groups collaborating in the Moon Village project, including the European Space Agency (ESA), the National Aeronautics and Space Administration (NASA), Roscosmos State Corporation for Space Activities (Роскосмос), the China National Space Administration (CNSA or 国家航天局), Japan Aerospace Exploration Agency (JAXA – 国立研究開発法人宇宙航空研究開発機構), and the Canadian Space Agency (CSA). Experts globally could contribute knowledge, expertise, technology, and even manpower (spacemen and women) for preparations for the Mars mission. Regarding a mission to Mars, Prof. Woerner said it is clear nobody is talking about flying directly to Mars within the next five to ten years. Mars is a very long way away, not only from the distance point of view, but also regarding what we have to do on the technology side. “To use the Moon as a stepping stone or as a pit-stop, that’s crucial, because we have to test, for instance, how to build structures on a planet, instead of bringing all the stuff there,” he said. Scientific research could be conducted on the Moon, as it currently is onboard the ISS, he added. The United States announced its intention in 2014 to keep the ISS operating until 2024, which postponed its retirement by at least four years. ESA is only committed until 2020, and a number of European countries are not too keen on being asked to cover costs beyond that date. Russia, on the other hand, which is an ISS partner, says it is looking at the option of building its own space station when the current collaboration ends. The International Space Station is a joint venture of NASA, ESA, Roscosmos, CSA and JAXA. All members, except for the European Union, have agreed to commit to the ISS mission until 2024. Prof. Woerner said yesterday that the ISS has great value and expressed hopes that European Union members would decide to carry on until 2024. According to Prof. Woerner, a lunar village would have several different types of uses and users. Nobody needs to make a formal decision now, ESA’s boss insisted, adding that he was simply airing his own ideas in public. As soon as the best location on the Moon to build the village is identified, nations, agencies and other interested groups can then decide whether they want to be involved in the project, and to what extent. Both China and Russia have Moon missions planned. He suggested that it might be more beneficial for them, and everybody else interested in space exploration, to combine resources, technology and expertise. How many would live in the Moon Village? When asked how many people would live in this lunar village, Prof. Woerner jockingly responded that it is an interesting question, as would be deciding who should be mayor of that village. In other words, it is not a question of how many inhabitants the village will have, but rather how many participating nations and organizations there will be, and what they will be contributing. The whole project would not be expensive, if one looks at the cost-per-inhabitant of the participating nations, rather than the total round number, Prof. Woerner explained. The annual cost would be less (per person) than the cheapest metro (subway, underground) ticket in Paris. When asked whether he would go to the Moon Village, Prof. Woerner said he would, and pointed out that he is still younger than astronaut John Glenn, the first American to orbit the Earth and then the oldest one when he orbited our planet the second time. Earlier this month, during a two day conference – ‘International Symposium on Moon 2020-2030’ – held at the Space Research and Technology Centre of the European Space Agency (ESA/ESTEC), 35km south-west of Amsterdam International Airport in The Netherlands, ESA scientists said robots could land on the Moon first and prepare the surface for humans, who would follow later. During their presentations, the European researchers showed what the Moon base would look like and how the human pioneers would live. CNNi talks to Jan Woerner about his proposal for a Moon Village.